Serra Cleansing Gel is a soap and preservative-free creamy gel cleanser that thoroughly, yet gently, cleanses skin of all impurities and make-up. Anti-inflammatory and anti-bacterial extracts protect and calm the skin during the cleansing process. This cleanser will not remove natural moisturising structures found in your skin and the product will restore the normal pH which is lost with extended periods of dryness. Massage gently in circular motions over the entire face, neck and décolleté. If your skin has been dry for a period of time, its pH will have changed to become more alkaline. The longer your skin suffers, the more the pH will change. 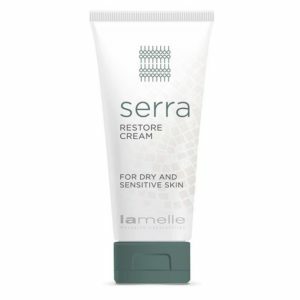 When using the Serra Cleansing Gel you might find it tingles at first. The product is simply attempting to restore the normal pH of your skin. Don’t stop using it; a normal pH is critical in a healthy, bacteria fighting skin.